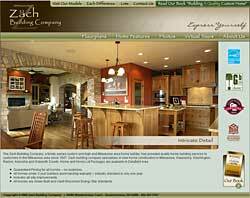 Milwaukee high-end residential home builder Zach Building Company has launched a newly designed Web site. This week's launch of the re-designed site coincides with the 10th anniversary of the relationship between Zach and Trivera Interactive, one of Milwaukee's oldest and most respected Web development firms. The new site uses a wider design to take strategic advantage of the higher desktop resolutions of today's monitors by allowing more content to appear "above the fold." To add a bit of visual impact, Trivera's design team embedded an animation on the home page that displays a montage of some of Zach's signature home construction examples. A new navigational scheme allows visitors to navigate the site easily and intuitively. That combination of best practice usability guidelines, and the embedding of the montage as a Flash element instead of creating the entire site in Flash, strategically preserves the site's high placement in the search engines. Affiliates, lots and models are given new attention. The site offers prospective customers and home shoppers the ability to view floorplans, learn about the quality features that go into every Zach-built home, view photos and take virtual tours of several of their homes. Also featured on the site is the new book, "Building A Quality Custom Home" written by company owners Mat and Bill Zach. The Zach Building Company is a family owned custom and high end Milwaukee area home builder that has provided quality home building services to customers in the Milwaukee area since 1947. Zach specializes in new home construction in Milwaukee, Waukesha, Washington, Jefferson and Walworth Counties. Since 1996, Trivera Interactive has been helping businesses solve challenges and build stronger relationships with best practice and state of the art web design, e-commerce, email marketing and Search Engine optimization.